Founded by Emperor Augustus around 15 BC, in 725 AD Autun would be the eastern most reach of the Muslim Ummayads in Europe. Much later, in the 1830s the town witnessed the beginning of the modern oil shale industry, and in 1852 gave its name to the mineral Autunite. Autun is steeped in many facets of history. Not surprisingly then that this town in the heart of the French region of Burgundy is a designated town of art and history. Following in Roman footsteps, in October Thomas made a brief stop here, and suggests Autun is more than just a staging post. 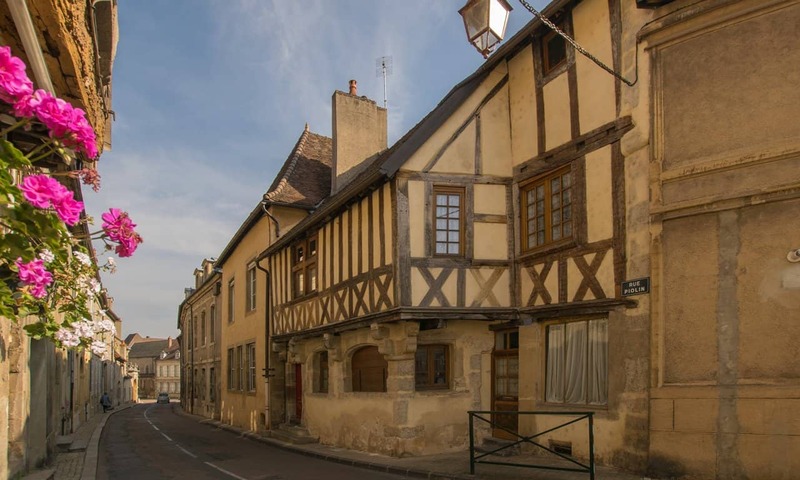 Typical 12th century townhouses built near the cathédrale Saint-Lazare in the early Medieval centre of Autun. Having just finished a cave art tour that ended in Nice I had a few days before I needed to be in London. A drive that would take me up the eastern side of France. From one distinctive part of the country, to another equally individual region on the northern coast. My first stop was chosen for its extensive Roman ruins – Vaison la Romaine. I spent three nights there which gave me one more night. In keeping to the Roman theme, I chose to overnight in Autun. Another town known for its Roman heritage; and one of 190 designated Villes et Pays d’art et d’histoire in France. The town has enjoyed two periods of great prosperity. For the Romans Augustodunum was a staging post on the road between Lyon and Boulogne-sur-Mer. A strategic position that meant the town fared very well under Roman administrators. Later in the Renaissance, one of Autun’s sons became chancellor to Philip III, Duke of Burgundy. As a leading figure in politics of Burgundy and France for over 40 years, Nicolas Rolin’s influence left a visible mark on the town. With this background I was sure there would be a lot to keep me occupied. A typical autumn sunrise from the Roman theatre. Although the artificial lake is much more recent than the theatre, the view for Roman theatre-goers would have been just as spectacular. My drive up eastern France was in mid October, well into autumn. One of the things I greatly enjoyed while living in France was autumn, particularly during October. Summer has definitely gone, but it is not yet winter. The days are noticeably shorter, but sunrise and sunset are still at agreeable times. The sun is certainly lower in the sky, but still high enough to cast a wonderful light. And while the trees are starting to lose their leaves, it is the changing and varied colours that confront you now – especially in the mountainous, heavily forested east where Autun can be found. I arrived mid afternoon, settled into my hotel room, and then set off to see as much as I could before nightfall. After an early night, I was up early to see the sunrise over the mountains from the Roman theatre. 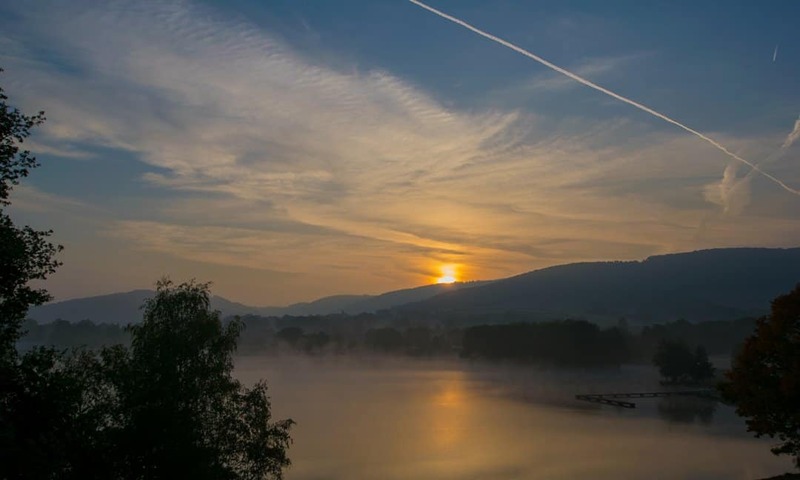 The steam rising off the artificial lake caught the sun as it rose into a clear blue sky. What a view these theatres have. Although the lake was not there in Roman times, the view back then would have been just as spectacular. The ancients had a wonderful habit of building theatres into the slope of a hill, specifically to maximise on the view out from the cavea over the orchestra and the stage. A natural backdrop to the performances and activities they were watching. Have you ever wondered how many Roman theatre-goers drifted off into a world of their own while staring into those views? Enough of this gazing into the sunrise, I had limited time! Autun may have been an important city and staging post for the Romans, but today it is away from the main north-south routes in France. Perhaps not off the beaten track, but still a delightful provincial town that takes a great pride in its historical heritage. Autun was established, by the Romans, on a low promontory coming out of the Autonois Hills. Exactly why the Romans chose this location is not known, but it was here that they set up a capital for the Iron Age Aedui people who had until then been living at nearby Bibracte. From above this promontory, where a Croix de la Libération stands, there are wonderful views out over the plain ahead. And the major historical landmarks are clearly visible. For example, in the panorama photograph above, on the very left edge just under halfway up you will see the distinctive Temple of Janus. Take a ‘2 o’clock’ line from there and you will notice two hills – like overgrown prehistoric burial mounds. Prehistoric they are not, but they are the result of human endeavours. These are the Mine des Télots, the slag heaps from shale oil mining; which began here in Autun in 1824. Down to the bottom right of the photograph is the 12th century cathédrale Saint-Lazare. Before you lies over 2,000 years of history, from the Romans to the Industrial Age. Although there is evidence of prehistoric occupation in and around the town, it is the Roman monuments for which Autun is particularly well known. There are more visible Roman remains here for visitors to see than anywhere else in northern and eastern France, roughly an area from Lyon to Strasbourg – to Paris and Boulogne-sur-Mer, and excluding the city of Lyon. Not surprising then that in a pamphlet produced by the local tourist office that lists ‘7 Merveilles à Découvrir’ (seven wonders to discover), 5 of these are Roman monuments. The remaining two are the Rolin museum, which has a large Roman collection, and the cathedral. Around 6 kms of ramparts were constructed, along with 54 turrets and bastions. These are still standing along what was the western edge of the Roman city. The Roman wonders of Autun are not over-hyped at all. They may not rival some of the sites in Provence or Nîmes, but the various points of interest complemented by a few decades of rigorous archaeological excavations show that there was considerable Roman investment in the town. That Augustodunum was a major Roman city. Apart from the theatre, there is evidence of a gladiators’ training school having been established by 21 AD. This suggests that there must have been an amphitheatre. These are the trappings of a large and wealthy Gallo-Roman city emerging in the 1st century AD. Although the city wall has been restored and rebuilt over the years since, there are 4km that are intact today with Roman construction still visible. Around 6km of ramparts were built, to a height of 11m and width of 2.5m, with 54 circular turrets and semi-circular bastions. What is unusual about these ramparts is that towns like Augustodunum, a civitas capital, were not given city walls in the early empire. This was reserved for colonies and provincial capitals. As impressive as these surviving ramparts and bastions are, best seen I think along the western edge of the ancient city, it is the two imposing city gates that really must be seen. There were four gates in all, at each of the four main roads leading out of the town. The two surviving gates Porte d’Arroux and Porte Saint-André are very similar to early empire gates found in other colonies of Gaul. At two extreme ends of Autun are the remains of two very different structures. In the south east is a pyramid-shaped funerary monument from the 1st century AD. This was in one of nine necropolises around the Roman city. At the north west edge of Autun is the very striking Temple of Janus, that survives to a height of 24m. Considered to be the best known of all Romano-Celtic temples, this temple was part of a much larger sanctuary. Three of the more striking Roman monuments in Autun, from left to right: the funerary Couhard Pyramid for the 1st or 2nd century AD; Porte Saint-André – one of the four gates to the Roman city, two of which are still intact; the Temple of Janus, one of the best known of all Romano-Celtic temples. The Romanesque Cathédrale Saint-Nazaire – built in the 12th century to house the relics of Saint Lazarus. 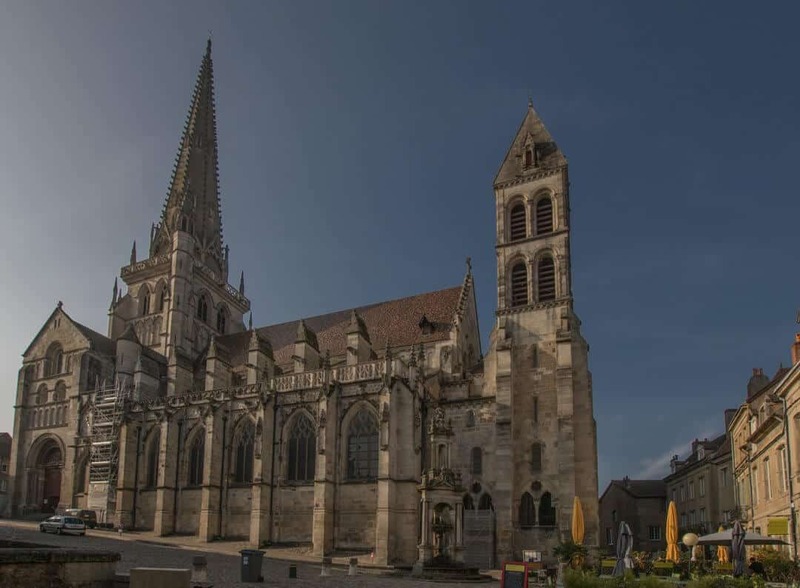 Like many cathedrals and churches in France, the cathedral dedicated to Saint Lazarus in Autun was built on top of an earlier church. The first cathedral was built during the 5th century and dedicated to Saint Nazarius. This church was ill-equipped to deal with the pilgrims who came to Autun to see the relics of Saint Lazarus. And so in the 12th century the bishop had a new cathedral built, one of the finest Romanesque cathedrals in France. As is also often the case, there were later additions, such as the 13th century flying buttresses and the 15th century spire and side chapels. All of which come together to produce an imposing cathedral. The tomb built for the relics of Saint Lazarus takes the form of a small church, and placed in the chancel. The tomb was destroyed in 1766. Unfortunately when I visited Autun the church was closed because of renovations to the interior. The nearby Rolin Museum has a fascinating display on Saint Lazarus’ Mausoleum, including scale and digital models, the archaeological work being undertaken in the cathedral, as well as a few sculptural fragments from the tomb. Although it was not possible to enter the church, the recently restored Romanesque carving on the west portal certainly made up for it. Above the doorway in the west portal is a carved tympanum depicting the Last Judgement. The name Gislebert appears at the feet of Christ. If this is the name of the sculptor as some believe, this tympanum is one of only a few named pieces we have from this period. Inside the church many of the capitals are richly decorated with typical biblical themes, including the well-known image depicting the ‘dream of the three wise men.’ If the tympanum is anything to go by and the interior capitals were carved by the same sculptor – these I want to see. 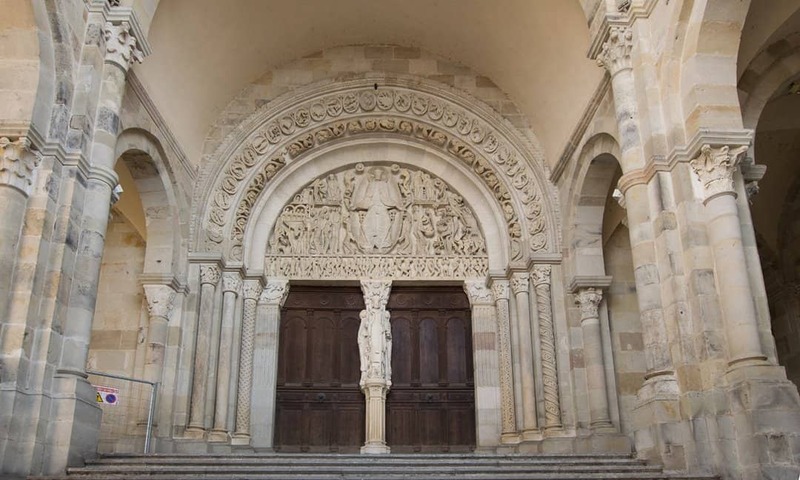 The cathedral’s tympanum above the western portal is one of the finest Romanesque carvings in France, and depicts the Last Judgement. As France was occupied by the Nazis, there are very few major towns that do not have some scars from the Second World War. But, I was not prepared for what I found by chance in Autun. I read in my trusty Bromwich volume for Northern and Eastern France that there was a portion of the cardo maximus visible in Autun. This would have been the main road that ran north-south about 1.5 kms in length between the northern and southern gates of Porte d’Arroux and Porte de Rome, respectively. It is not a large section by any means, but worth seeing. After all this is a section of the Via Agrippa, which linked Lyon to Boulogne-sur-Mer, one of the main Roman roads through Gaul. A small section of the 8m wide road surface made up of large granite rocks is exposed next to some recent apartment blocks. The guttering and pavement have not survived but were noticed in excavations made during the 1870s. What you see is not the original road, but generally thought to be a reconstruction carried out during the 4th century AD. An exposed section of the Roman cardo maximus (left) and the memorial to the eight men tortured and executed on this spot in 1944 by the Nazis (right). Followed by the names of eight men. Translated, In this enclosure 8 members of the resistance were cowardly tortured and executed by the Germans on 8 September 1944. This incident, for which I can not find any further information, took place three months and two days after the D-Day invasion of Allied Forces in Normandy. What I did find online is that the psychiatric hospital in Autun was used by the Nazis to imprison Jewish women and children (Source). Jacob and Paia Patzierkovsky were interned here on the 16 of July in 1942. On 8 August they were separated and sent via Pithiviers and Drancy Deportation Camps to Auschwitz, where they were both executed on 24 and 31 August of the same year. Of the handful of museums in Autun I was only managed to visit the Musée Rolin. 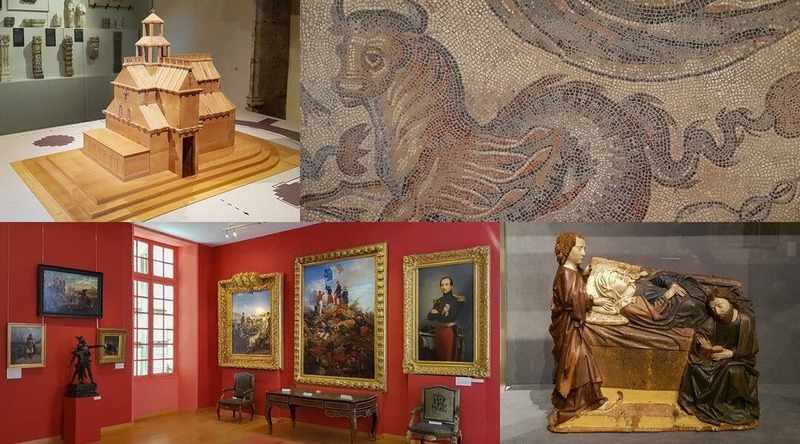 Here you will find a vast collection of art and artefacts relating to Autun, from the Gallo-Roman period, the Middle Ages and a very impressive fine arts collection. My intention was to spend and hour or two in the Gallo-Roman galleries. I really wanted to see the mosaics. But the collections on display representing the Middle Ages were quite captivating. Many truly exquisite pieces. And of course as most of these were local artefacts, they attest to the wealth of the town of Autun at these times. Named after Nicholas Rolin, the museum is housed in the l’Hôtel Rolin, the Medieval townhouse in which he was born in 1376. The son of a local bourgeois couple, he went on to become the chancellor to Philip III, Duke of Burgundy, in 1422. A post he held for some 40 years. Rolin was an extremely influential figure in the politics of Burgundy at the time. He was instrumental in securing Burgundy’s independence from the English during the Hundred Year’s war. His son was a Bishop of Autun, and went on to become a Cardinal. Rolin’s portrait by Jan van Eyck now hangs in the Louvre. One of the highlights of the Middle Ages section of the museum was the display of the 12th century Mausoleum of Saint Lazare. As the cathedral was closed, I greatly enjoyed seeing a model of the tomb built to hold the remains of the Saint Lazare. The display included fragments of architectural features from the tomb, as well as interactive 3D digital displays showing the research and restoration of this amazing structure. Highlights of the displays in the Musée Rolin, clockwise from top left: model of the Mausoleum of Saint Lazare; portion of the so-called Neptune Mosaic depicting a marine monster that had the head of a bull and a serpent’s tail; a polychrome carving from the mid-15th century depicting the sleeping Virgin Mary; the 19th century gallery. 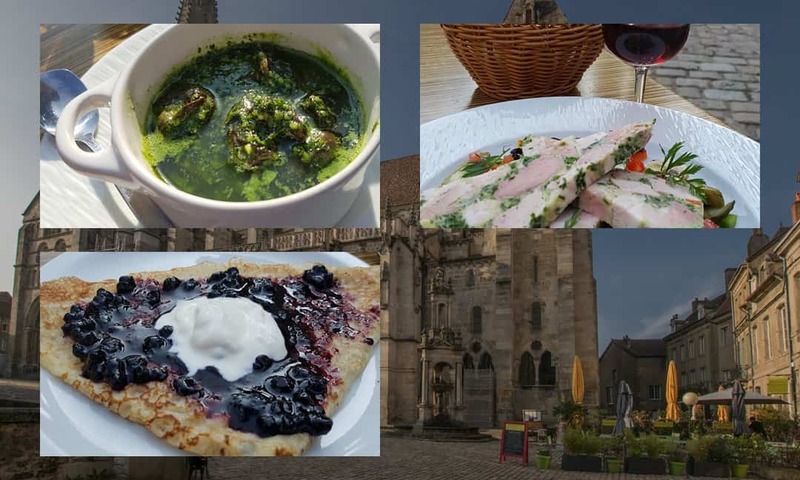 As I had a very late ferry from Calais to Dover, a six hour drive to Calais, and a few attractions I still wanted to see, I did not have time to sample too much of the gastronomic delights of Burgundy. The cuisine of this region of France is well known throughout the world, and based on distinctive local wines. These wines are a key ingredient in the creation of sauces, typically à la bourguignon. Essentially meats are cooked in a red wine along with mushrooms, baby onions and bacon. Two classic Burgundy dishes most people will recognise are boeuf bourguignon and coq au vin. Perhaps not the kind of dishes one eats before a six hour car journey. But it was a typical late October day, bright and warm in the sun. And the tables outside the restaurants at Fontaine Saint-Lazare, of course named after the nearby cathedral, looked very inviting. Their menus had just what I wanted for a light lunch. So I opted for two local starters and a small glass of local red wine. I reckoned these would be easily walked off before I would get in the car and head north. Of course I had to have Escargots à la Bourgogne; snails in a hot sauce of butter, garlic and parsley. While living in Normandy, my octogenarian neighbour taught me to prepare my own snails, using a typical Burgundian method. So to eat snails in the autumn sunshine in Burgundy, in view of a stunning Romanesque church, not only seemed truly fitting, it brought back many wonderful memories of being in France. Keeping it light, my second choice was another local speciality, jambon persillé. Ham hocks simmered in a Burgundian white wine, out of which a terrine is made using generous amounts of parsley. And served with pickles. Granted this is more of a summer dish than an autumn one, but it was all I could manage under the circumstances. Cassis, or blackcurrents, feature prominently in desserts in Burgundy. After all this is where the ‘real’ crème de cassis originates. Fresh crêpes with a hot blackcurrent sauce and a spoon of vanilla ice cream was the perfect end to my all to brief brush with Burgundian cuisine. As a Ville d’art et histoire, there really is a lot to see and do in Autun. I very much doubt I scratched the surface, for which I blame spending far too much time in the Rolin Museum. This picturesque town is certainly a good stopover for anyone travelling between the north and south of France, along its eastern side. Given its influential history and the many attractions in and near Autun, I am equally sure the town warrants more than a 24 hour stopover. Musée lapidaire Saint-Nicolas – Although I got to see all the Roman sites in Autun, I did not have time to visit the lapidary museum. Apparently the museum has an extensive collection of Roman stonework, including columns and capitals, remains of the aqueduct, fragments of fountains, statuary and sarcophagi, the usual range architectural fragments and 130 grave stelae. The tour des Ursulines, which is only open in the summer, is a commanding octagonal tour at the very highest point of the town. At the top of the tower is a statue of the Virgin Mary, 3ms in height. When the tour is open it is possible to climb to the top and get great views over the town. There is also much to see just walking around the town. For anyone following in the footsteps of Napoléon Bonaparte for example, may want to see the Jesuit college he and his brothers attended as teenagers. Now a high school, the Lycée Joseph Bonaparte can be seen on the west side of Place du Champ de Mars. The Iron Age settlement of Bibracte is only 30 minutes away. Of course there are a number of castles in the area, of which Château de Sully is one close by. 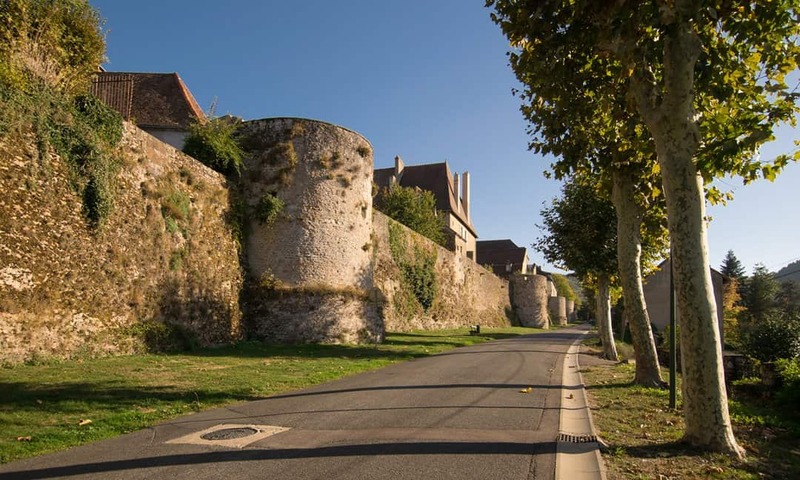 At the fortified Medieval village of Châteauneuf-en-Auxois there is a fine example of 14th century Burgundian military architecture constructed during the Hundred Years War to defend the village.